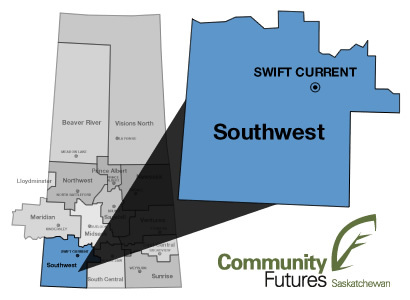 Community Futures Southwest, originally called the Southwest Saskatchewan Business Development Centre, opened its doors in August 1990 in the Town of Gull Lake, SK. In April 1994, the name was changed to Southwest Community Futures Development Corporation, its legal name, and now operates as Community Futures Southwest. In December 1996, the organization moved its location to Swift Current, SK. A volunteer Board of Directors - oversees the operation of Community Futures Southwest. It is the responsibility of each volunteer board member to protect the integrity of the organization's finances and maintain the innovative initiatives developed by the organization. Board Members provide governance for the organization, represent the organization in the community, and ultimately, accept legal responsibility for it. Board Members act on behalf of the Community Futures' constituents – the citizens of the community. The Board has the responsibility for carrying out the organization's mission and strategic objectives. Board Members accomplish their functions through attendance at regular meetings as well through participation on committees and sub-committees. Board Recruitment Policy - When a vacancy on the board occurs, the outgoing Director and the General Manager will meet and identify a suitable candidate for replacement. Interested individuals may also put their name forward. The names of potential candidates will be referred to the nominating committee who will ensure that the criteria to become a board member is being adhered to. In accordance with policy. Selection of candidates in the region will be selected ensureing they are eligible in gender equality. Knowledge of board responsibilities, have a sense of community and business development. The nominating committee will then recommend to the full board of directors a selected candidate for approval for up to 3 terms of 3 years.